“Our tactic was to leave Charlie Adam and Luke Varney, who are both pretty good in the air for their size, free to attack the ball. We’d just keep our back four in position and not mark men individually … and it seemed to work”. Note: For the purposes of doing this a video of the first half of the match was all that could be found. 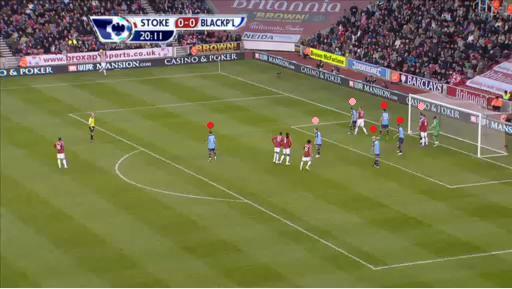 In the first half Stoke had three long throws delivered by Rory Delap in to the box. All three were unsuccessful. For the duration of the match there were a further 6 long throws and 3 were successful. The set up before Delap releases the throw. The defenders are marked in red and the others players in pink. As the team take their shape you can see that Gary Taylor Fletcher in front of the front post (pink) and Charlie Adam on the goal line (pink) are the only players assigned marking duties. The defenders (red) are free from marking the opposition, in space and set to defend the second balls, as is David Vaughan (pink) just outside the 6 yard box. The player positions are further illustrated in the diagram below in case the above isn’t clear. Above is a simple illustration of the positions taken up in preparation for the Delap long throw. Of the 3 long throws examined for this piece, Taylor-Fletcher won the first and Charlie Adam won the next two. The danger was cleared each time and the defence never came under any pressure. This serves to back up what Evatt said apart from the fact that these examples showed Taylor-Fletcher in the role of Varney. Blackpool at times this season have been derided for their lack of defensive quality, however, this shows that more thought and work is being applied to the defensive side of the game and 2 clean sheets in December added to more talk from Holloway about the defensive side of the game has shown that he is always looking to develop. Should the back four continue to develop and the team defend well as a whole then more clean sheets could well be on their way. « What's in a pass?